The final Christmas card feature is on the Gifts of Kings design. I used this antique gold paper for a 50th wedding anniversary card recently and loved the paper. It is so rich looking and very chic. I had the Point of Grace Christmas song One King in mind when I made this card. I think it's a beautiful song describing the gifts of the magi and the gift of the one and only true king, Jesus. To me, it says that the riches of this world are of no comparison to what they will be beyond this earth and our time here. Material things look pretty small next to a lifetime of hope and an eternity of life after death. I have ended the features on cards with this one because ultimately, this is what Christmas is all about and how it all began: the birth of a Savior. *If you would like to know more about the Christmas story and season or "rediscover" it as we approach Christmas, You Version is a good source for reading. I LOVE my Fontanini nativity collection. The details are so incredibly beautiful. This is another nativity, but a simpler version made out of olive wood. Read more about it in the link. Gold makes your decor a little more lush. Find small gold Christmas trees or decorate with only gold ornaments for a glitzier look. Gold and black is very elegant as well. This look can carry you through all the holidays-Thanksgiving, Christmas and New Years. Use a Christmas song as a placemat for a neutral backdrop to a gold place setting. Keep a gold wreath simple and eye-catching. Garlands of gold ornaments can embellish your mantle for some shine. 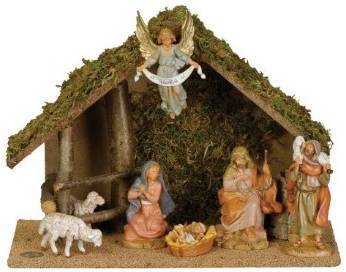 Another mantle decorating idea is to use the nativity scene through illustrations arranged in a banner form. Gold Christmas lights create a warm glow on your tree. Don't forget to gild your packages too! I think this tape is amazing and would be beautiful on craft paper.